Frugal food and grocery tips – how to be more frugal in 2019! 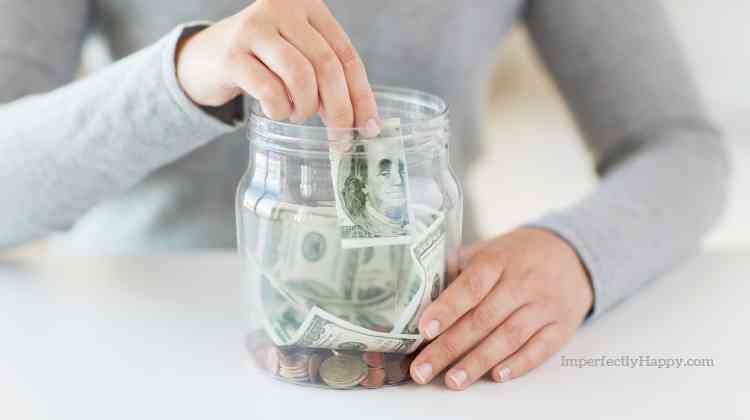 This is the first article in my series on living more frugally next year. Today I want to give you my top 20 frugal food and grocery tips. I hope these help you to make some better choices for your finances and health in the new year! Webster’s dictionary defines frugal as: characterized by or reflecting economy in the use of resources. But MY definition of frugal or frugality is being a good steward of the finances you’ve been giving. Meaning, you live within your means, you are not in debt (especially to credit cards), you save money and you have enough left to help your church or charities close to your heart. What being frugal DOESN’T mean! Being more frugal isn’t all about denial and not enjoying life. It doesn’t mean you never have fun, go out to eat or see a movie in a theater. I mean, sure, it can mean that but it really doesn’t have to. In the early days of frugal living you may feel like it is all about denial; but it is more about re-prioritizing! Grow a garden. Even if you have limited space you can grow vegetables and herbs for a fraction of the store-bought cost. Buy in Bulk. Especially when things are at rock-bottom prices. For instance you may not need 6 lbs of ground beef for a meal but you can take that big bulk package and section it into 1 lbs portions and freeze them for later use. Learn Shopping Sale Cycles. Stores run sales in cycles and this is when you want to stock up on those items, and store for later use. See my Stock Up in November and Stock Up in December for lists to get you started! Eat Real Food. This may be the best advice in my frugal food and grocery tips! There are a lot of reasons to stop eating stuff from boxes and packages but let’s just stick to the monetary reason here. Real food (not processed) will keep you fuller because it is nutrient dense. This means you’ll be consuming less and need to BUY less. Eat Leftovers. This isn’t rocket science but I see too many people throwing away good food. I purposefully cook a little extra at dinner so that we have good food to eat for lunches (and sometimes breakfast). Leftovers are typically a lot less expensive than lunch meats, frozen or boxed meals; and a HUGE savings over eating out! Learn to Cook! I mean really learn to cook from scratch with whole foods. This skill seems to be lost on my generation and younger. I don’t understand it because not only does it taste better it is more nutritious (generally) and you definitely save money. See: 10 Amazing Reasons to Be Cooking from Scratch. Make a Menu. Frugal food and grocery tips don’t get much easier than this! We get paid twice a month at our house. So I generally make a 2 week menu out before payday. I first look at the calendar to see our commitments for the week. If I know we have days where I’ll be out of the house most of day then I’m going to plan a crock pot or fast Instant Pot meal. Too often people let they busy life dictate eating out all the time; that’s a planning issue! Again if you plan to make a little extra dinner then you have great leftovers for lunch the next day. See Great Depression Meals You Can Make Today & Save Money. Don’t Shop Without a Budget! Do you know what your food and grocery budget is? If you don’t have one set then you need to stop and get that done NOW! I also suggest shopping with a calculator and adding up your purchases as you put them in your cart. This way you won’t be surprised at the end. I always round UP as I add in items (so if the price is $4.79 I put $5.00 in the calculator). Don’t Shop Without a List! Once you have that menu and a budget you need a list of the EXACT items that you need. Shop ONLY from the list and don’t be swayed by grocery store impulse buys. It helps to shop alone too because kids and spouses can get you off track. Being single minded and don’t get anything that isn’t on that list! Use Generic Label Products. If you have to buy something that is packaged don’t be afraid to use generic labels. They are produced by the same high-end facilities but don’t have the HUGE marketing costs so you pay less. The quality and taste are the same for the most part. Share Bulk Items. If you are buying in bulk but have no means to freeze, can or store the items consider sharing them with friends, family or neighbors. You split the cost of the items and still enjoy the bulk discount. Visit a Pick Your Own Farm. If you can’t grow it yourself, consider going straight to the source for your produce. Farmers and orchards will sometimes offer pick-your-own produce at a fraction of the cost because this cuts out the middle man. See: Pick Your Own for a list of farms doing this in your area. Join a Buying Coop. Another easy frugal food and grocery tip is to check out coops like Bountiful Baskets. They can save you money on healthy, and often organic, produce by collectively buying in bulk and distributing it among the members. When Eating Out… Let’s be realistic, you’re probably going to eat out from time to time. So number 16 for frugal food and grocery tips is about eating out. Most restaurants offer a discounted menu during early dinner times, generally Monday – Thursday. So if you want a treat meal plan a weekday meal before 6:00 pm. Drink Water. It is amazing how quickly sodas, pre-made teas and other drinks add up on the grocery bill. Stick to water – not only will this save you money but it is healthier too. DIY Spice Mixes. Instead of buying those pre-made envelopes or jars of mixed spices, make them yourself. You can store them in old spice jars or mason jars for later use. See: DIY Taco Seasoning and DIY Spice Rubs. Have a No-Buy Day or Week. Once you’ve budgeted, planned and shopped it should be easier to stop making daily or weekly trips to the grocery store. This emergency shopping generally blows your budget so if you find that you have to keep making pit stops then you need to re-evaluate your budget and your menu so that you have enough to last through the period of time you have allotted. When it comes to frugal food and grocery tips you’ll get better with practice. Have More Potlucks! 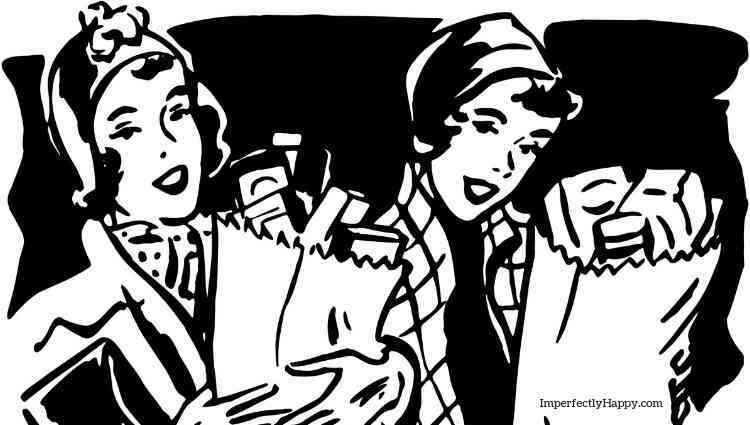 My last of the frugal food and grocery tips has to do with parties and gatherings. As I write this we are in full Christmas party season. If you are hosting a gathering don’t feel like you have to provide ALL the food. Make a menu and ask people to sign up or tell them what main dish you’re making and ask for a savory or sweet side dish. I hope these simple suggestions help you in your journey to a more frugal way of life. Living frugally isn’t about denial but using what we have to go the long haul and not always feeling like money is the enemy. What are your favorite frugal food and grocery tips? Let me know in the comment section! Stock up in December for big savings on groceries and more! Tis the season to overspend, but it doesn’t (and shouldn’t) be that way. We can stock up in December on pantry items AND gift items. Remember before you plan out your stock up in December, you want to have space for your extra items! This is a great time of the year to put some staples in your pantry that you can use over the next few months too. So whether you are you stocking up for emergency, gifts or just to have extra for a rainy day, this December stock up list should help you out. Remember, if you have discounted items you won’t use but can afford to buy (or get free), you can donate them to your local charities! Stocking Up Tips To Remember! Remember sales have cycles and stores will post lost-leaders (losing money on an item) to get you into the store in hopes that you’ll buy more. Make sure you need it! Check your available space – where are you going to store your December stock up items? Make a list of everything you are looking for and don’t be tempted by impulse buys! Make sure the food items you buy have the latest expiration date OR make sure earlier dates get put to the front of your pantry. Buy items that have multiple purposes for you, your pets or your home. Plan to shop at several stores for the best deals. Always check online for deals with free shipping. Have a set budget for December stock up items so you aren’t over-spending. Even a good deal should be passed up if you can’t pay your bills! Consider purchasing an inexpensive Food Saver to increase your storage time and put things is smaller increments; great for big bulk buying and work for pantry, refrigerator and freezer. Check store coupons – many stores will accept competitor prices and coupons! Don’t go into debt! If you have to use a credit card to get these items then you really aren’t saving yourself any money in the long run. Thanksgiving food / pantry items. Just make sure that you check those expiration dates on non-perishable items (most will be pretty far out). Turkey – they’ll be rock bottom on 12/1. According to the USDA turkeys can be kept frozen in the freezer indefinitely; however, cook within 1 year for best quality. Check out Stock Up in November for more items that are still inexpensive in early December! Christmas Seasonal Item – These will get lower after Christmas but you can still get some great deals all month long! Baking Items like spices flour, sugar, mixes, condensed and evaporated milks, crusts, baking power and soda, non-stick sprays, nuts, chocolate chips. Stock up In December on these food items that you can freeze or refrigerate! Fragrances – I can usually find body splash or fragrance scents for rock bottom prices before Christmas. I will often get some for holiday gifts, Secret Santa gifts and save a few for upcoming birthdays. Toys – you’ll get your deepest discounts after Christmas but online deals are abundant before the holidays too. Get small, inexpensive items for your kid’s birthdays, future parties you’ll be invited to, etc. This way you’ll have gifts to choose from and won’t be bombarded every time your child is invited to a party. There are great deals on home improvement and tools during the month of December. Be sure to check multiple stores for the best deals! Before Christmas look for those single loss-leaders like socks, mittens, gloves, slippers or pajamas. After Christmas almost all your winter clothing will be hugely discounted! Many small business, online and otherwise will offer sales and discounts before Christmas. I like to shop small and local businesses and give unique gifts that can’t be found in large stores. Many of the big brand stores will offer specials when you purchase gift cards so make sure to keep an eye out for those! I hope this list of what to stock up in December helps you get your pantry and freezer full for a fraction of the cost. I know these sales help us to make Christmas lovely without killing our savings or going into debt. The food discounts also help us to make a large donation to our local food bank – something you might want to consider too.